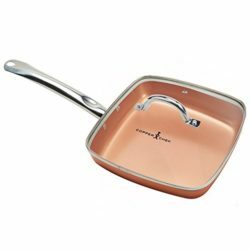 The Copper Chef was designed with a stainless steel induction plate that makes for perfect cooking on any surface. 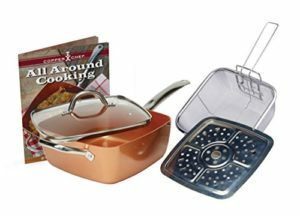 From electric, gas, ceramic and even induction cooktops. 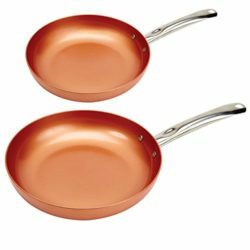 The Ceramic-Tech non-stick technology, which is PTFE and PFOA free, means nothing will stick. Cook without butter, oil, or chemicals. The riveted handles allow for high heat and is oven safe up to 800 degrees. Copper Chef FAQ’s:, Pan size- 9 1/2 inches- 4.5 Quarts, The Stainless Steel Induction Plate means no hot spots. Allowing for fast, even cooking. 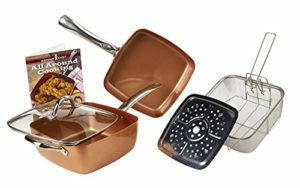 Ceramic-tech non-stick coating allows for easy clean up, Dishwasher safe, Our square design allows for a 25% large cooking surface compared to a round pan. 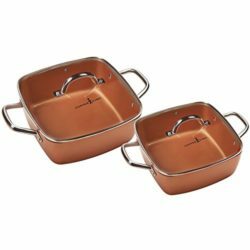 This entry was posted in Copper Pots and tagged 5Piece, Chef, Cookware, Copper on August 13, 2017 by admin. 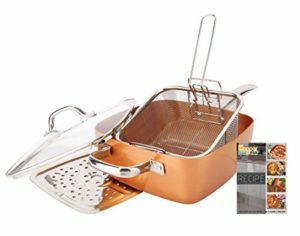 This entry was posted in Copper Pots and tagged Chef, Copper, system on August 13, 2017 by admin.